Taxonomists have recently identified four lineages of Aneides flavipunctatus (notes and map below) but they have not yet recommended the recognition of these lineages as separate species. To show this diversity, I have divided up pictures of the existing subspecies Aneides flavipunctatus flavipunctatus and its habitat on this page according to which of the three lineages they belong. The fourth lineage is found on the Aneides flavipunctatus niger page. Large-spotted adult, Mendocino County Large-spotted adult from Lake County. Juvenile, frosted form, Humboldt County Juvenile, Humboldt County Juvenile, Humboldt County, with juvenile Ensatina for comparison. © Zach Lim Adult, eastern Tehama County, just north of Red Bluff, which should represent a range extension for this species. Black Salamanders have toes with rounded tips. which have toes with squared-off tips. A Black salamander is discovered under a rock on a sunny late November afternoon in Mendocino County. Several adults and a juvenile move slowly and with amazing bursts of speed. Sprinting Black salamanders from Humboldt County. Adults measure 2 - 3 3/4 inches long (5.1 - 9.5 cm) from snout to vent, and up to 5.5 inches (14 cm) total length. A medium-sized salamander with two nasolabial grooves and 14 - 16 well-defined costal grooves. Dorsal coloring varies depending on the locality - it can be solid black, black with fine white specks, black with large white spots, black with pale yellow spots, black frosted with green or gray, or black with many small white spots. The venter is greyish black. Males have a broader head than females. Young are black with a brassy or greenish coloration and yellow at the base of the limbs. Adapted for climbing with long toes and rounded prehensile tail, but mostly terrestrial. Adults forage for small invertebrates on the ground at night during wet weather. May be active along streams all year at the southern part of its range, but most stay underground during dry periods. Adults appear to be agressively territorial. Black Salamanders have lived as long as 20 years in captivity. When threatened, juveniles typically remain still while adults attempt to flee. Other defense tactics include defensive posturing - raising the body, lowering the head, and waving the tail, jumping, releasing noxious sticky skin secretions, and biting. Diet consists of a variety of small invertebrates, including millipedes, ants and termites. 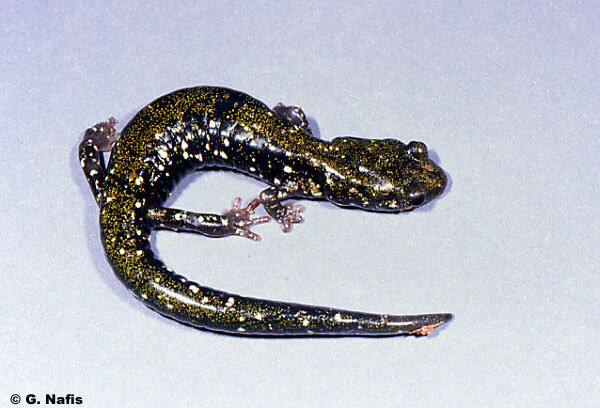 As salamanders grow larger, they eat fewer, but larger prey items. Courtship and breeding behavior is not well known. Females probably lay from 8 - 25 eggs in moist cavities belowthe ground in July and August. Eggs are attached by peduncles. Females stay with the eggs until they hatch. Occurs in mixed deciduous woodland, lowland coniferous forests, coastal grasslands. Found under rocks near streams, in talus, under damp logs, and other objects. This subspecies occurs from Sonoma county north along the coast and coast ranges to southwest Oregon in Jackson and Josephine Counties, and east to near Mt. Shasta. Another subspecies occurs in a small area north of Monterey Bay. The southern population south of the San Francisco Bay is currently recognized as the subspecies A. f. niger by some researchers, or as the species A. niger by others. The group south of Mt. Shasta is also isolated from populations to the west. Two distinct groups are separated in Humboldt County along the boundaries of tectonic plates. In a 2014 paper,4 Reilly and Wake continue to show four species-level units of A. flavipunctatus, but they do not describe any new species. They also show support for two populations within the Central Core. They show that two of the boundaries between these species-level units are associated with current tectonic plate boundaries and that the break within the Central Core population is associated with uplift associated with tectonic plates. They also show the contact zone between the Northwest and Central lineages farther north in the vicinity of the Van Duzen River in Southern Humboldt County. In a 2013 study3 Sean B. Reilly et al. 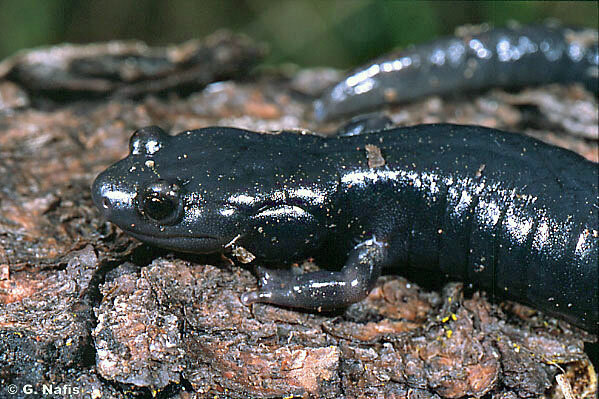 concluded that there are three distinct populations of Black Salamanders in the Klamath, Rogue, and Smith River watersheds and that "The population in Shasta County should be given special conservation consideration, as it is the most distinct population genetically, and may represent a species distinct from Aneides flavipunctatus. The three populations recovered from our linked model clustering analysis, found in the Klamath region west of Shasta County, should also be managed as distinct conservation units." However they did not recommend elevating the Shasta County population to species status. 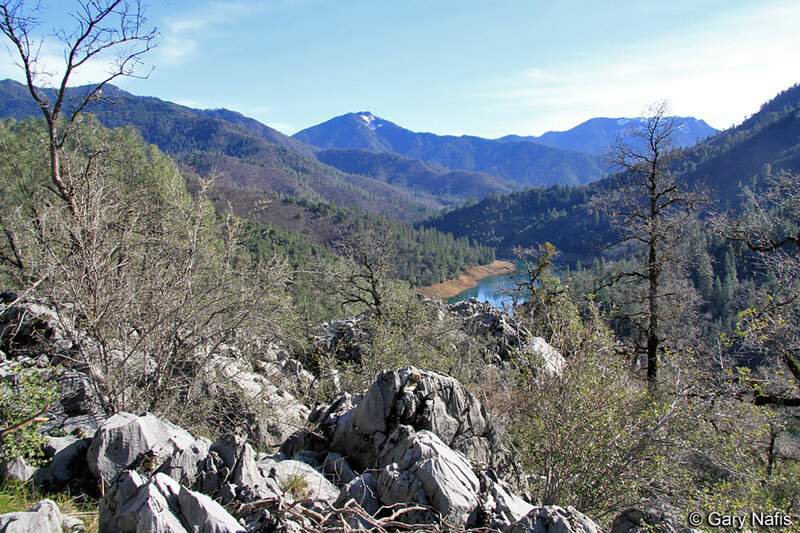 "While we believe that the Shasta population represents an independent evolving lineage, elevation of this lineage to species status would render the rest of the A. flavipunctatus complex paraphyletic. Studies are currently in progress on the entire A. flavipunctatus complex, and future publications will include detailed phylogeographic studies with much greater sampling density than in prior studies, and a comprehensive taxonomic revision." In a 2012 study2, Sean B.Reilly et al. 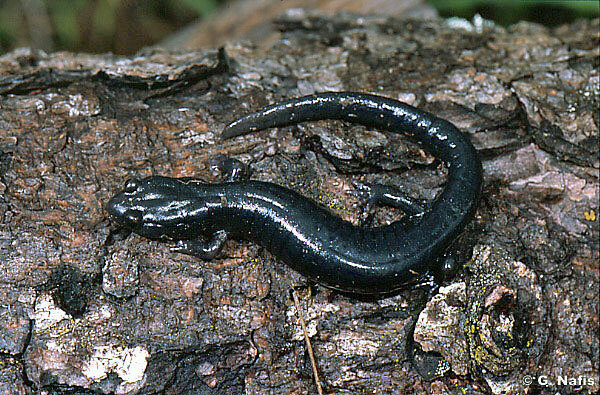 concluded that " Black Salamanders in northwestern California belong to at least three or four populations or species, and these all meet criteria for being Evolutionary Significant Units or ‘ESUs’ and therefore warrant conservation consideration." They did not describe and name these species. 4. Northwest lineage in the northwest corner of the state including Humboldt, Del Norte, and Siskiyou Counties. There is another population within the Central Lineage which is also distinct, but they do not discuss this in detail. They recommended that the Shasta and Southern lineages be elevated to species status, but that more work is needed to determine the southern extent of the Northwest lineage. Once that has been determined, they recommend that the Northwest lineage also be elevated to species status. A new name or names will be given to the Northwest lineage (Red) and other lineages. Tentative distribution map of the four main lineages of Black Salamanders. 2 Sean B. Reilly, Sharyn B. Marks, W. Bryan Jennings. 3 Sean B. Reilly, Mitchell F. Mulks, Jason M. Reilly, W. Bryan Jennings, and David B. Wake. 4 Sean B. Reilly and David B. Wake. Cryptic diversity and biogeographical patterns within the black salamander (Aneides flavipunctatus) complex. Disappeared from many areas of their range. 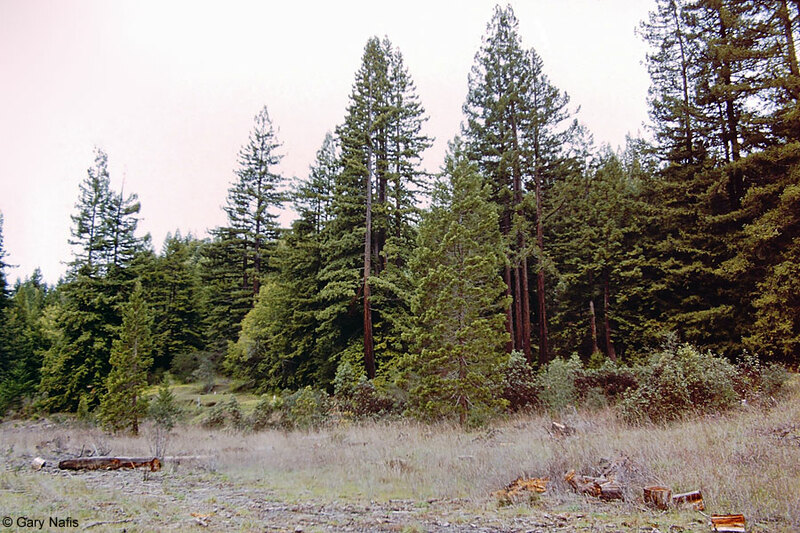 Much prime habitat has been lost when it has been converted to agricultural use, especially vineyards, and probably through logging of forests. The population in Shasta County should be given special conservation consideration, as it is the most distinct population genetically, and may represent a species distinct from Aneides flavipunctatus. flavipunctatus: Latin - yellow spotted - refers to conspicuous white or yellow spots on dark background.